Department of Pediatrics, King Abdulaziz University Hospital, Jeddah, Kingdom of Saudi Arabia. Neonate, Holt Oram, Skeletal abnormality, Hypoglycemia, Hypopituitarism. Holt-Oram Syndrome (HOS) is a genetic condition also known as heart-hand syndrome caused by mutations in the TBX5 gene on chromosome 12q24 and is inherited in an autosomal dominant manner . It could result from new mutations in the gene and occur in people with no family history of the condition . The range of clinical features depends upon the size of deleted segment. These skeletal abnormalities may affect each arm differently, and most of the cases the left side is usually affected than the right side . Hypopituitarism could be presented as isolated or multiple hormonal deficiencies. Panhypopituitarism defined as deficiency of two or more of pituitary hormones . 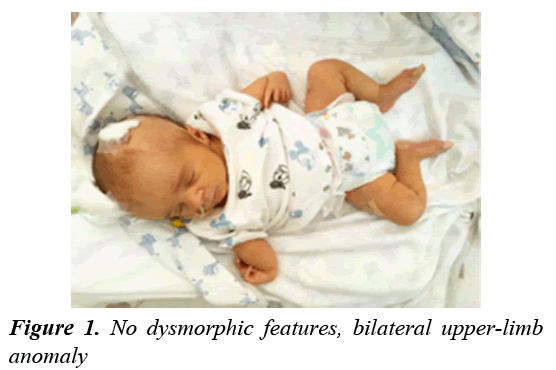 Congenital hypopituitarism may be caused by birth asphyxia, trauma, and midline defect syndromes such as Septo-optic dysplasia and mutation of genes encoding pituitary transcription factors. The signs and symptoms of hypopituitarism depend on which hormones are undersecreted and on the underlying cause of the abnormality . We report a case of HOS associated with congenital panhypopituitarism. A 25 days old male neonate, a product of 38 weeks gestation delivered vaginally, his birth weight was 3 kg and his length was 51 cm. Delivered to first-degree healthy cousins with a positive family history of same anomaly in mother’s first cousin but with no history of panhypopiuitarism. Antenatal history was uneventful; the mother was healthy not known to have any chronic illnesses. No history of gestational diabetes, drug intake or radiation exposure. Natal history the anomaly revealed by the ultrasound at 4 months of gestation with no cardiac defect. Postnatal history uncomplicated delivery. He was admitted after delivery immediately to Neonatal intensive care unit due to tachypnea, jaundiced needed phototherapy and recurrent episode of persistent hypoglycaemia started at one week of age. On examination, bilateral absent radius, short curved ulnar and absent thumbs (Figure 1). 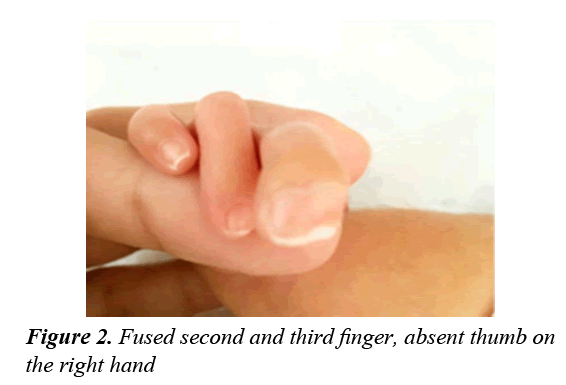 Fused second and third finger on the right hand (Figure 2) and hyperextended index finger on the left hand (Figure 3). No other dysmorphic features or obvious skeletal deformities were found in the lower limbs or elsewhere. Other systemic examinations were normal, apart from genital examination of micropenis (Stretch penile length was 2 cm) (Figure 4). On Investigation chromosomal analysis showed 46 XY genetically male. Hormonal investigations (Table 1) showed low cortisol and growth hormone. Brain and pituitary CT and MRI showed average size pituitary gland. ECG was normal. Abdominal ultrasound was unremarkable. The classical associations of HOS are abnormally developed bones in their upper limbs in the form of missing or triphalangeal thumb, partial or complete absence of Radial or Ulnar bone, underdeveloped Humerus, and abnormalities that affect the Clavicle and Scapula. However, there are variant association published in varies countries. A four month old Iranian male presented with rare associations of atrial septal aneurysm, tricuspid atresia and pulmonary stenosis . Another case report of a Nigerian neonate female with a postnatal diagnosis of syndromic anorectal malformation associated with bilateral corneal opacity and microcephaly . A case report was reported of aortic atresia which is a rare association . A published case report of a 2 month old female with HOS associated with monilethrix as the cause of congenital hypotrichosis, absence of hair since birth in all her body parts such as scalp, eyebrows and body . Hypopituitarism usually presented in neonate with recurrent hypoglycaemia, prolonged jaundice, electrolyte disturbance and micropenis and this is how our case presented. Hypopituitarism is associated with higher mortality due to increased cardiovascular and respiratory diseases, and early diagnosis is important to prevent further morbidity. It can be due to congenital or acquired causes. Congenital absence of the pituitary gland may be accompanied by different anterior pituitary deficiencies due to midline and craniofacial defect, for example septo-optic dysplasia, single central incisors or midline facial clefts . Individuals with optic nerve hypoplasia 75% of them presented with hormonal abnormalities . Genetic mutations in transcription factors that responsible for pituitary development can vary in presentation such as combinations of one or more hormonal abnormalities with or without anatomic abnormalities these transcription factors are HESX1, LHX3, LHX4, PROP1, and PIT1 . There are other cause may also result from severe asphyxia after birth immediately or shortly thereafter. This neonate was diagnosed to have panhypopituitarism because of prolonged neonatal jaundice, decrease activity, persistent hypoglycaemia with hormonal investigations repeated twice during hypoglycaemic attack confirmed to have thyroxine, cortisol and growth hormone deficiencies for which he was started on hydrocortisone, GH, and thyroxine hormonal replacement therapies. There was remarkable improvement of his clinical status with resolution all mentioned symptoms and was discharged home in a good healthy condition. There was no obvious cause of his congenital panhypopituitarism as brain imaging was completely normal and his pituitary size was normal. His panhypopituitarism was labeled as idiopathic. In this case report we are reporting a new association between HOS and panhypopituitarism that has not been reported previously diagnosed as recurrent hypoglycaemia, hypothyroidism and growth hormone deficiencies. Parents have agreed for case report publication. Congenital panhypopiuitarism has never been reported with HOS this is the first reported association. We have to increase awareness of such association in the future for general paediatricians. Koçak Eker H, Altunoglu U, Toksoy G, et al. Holt-Oram syndrome because of the novel TBX5 mutation c.481A>C. Clinical Dysmorphology 2016; 25: 192-194. Hurst J, Hall C, Baraitser M. The Holt-Oram syndrome. Journal of Medical Genetics 1991; 28: 406-410. Srinivas SK, Balekundri VI, Manjunath CN. Holt-Oram syndrome with aortopulmonary window-A rare association. Cardiology in the Young 2013; 24: 947-949. Kurtoğlu S, Özdemir A, Hatipoğlu N. Neonatal hypopituitarism: Diagnosis and treatment approaches. Journal of Clinical Research in Pediatric Endocrinology. 2018. Shankar B, Bhutia E, Kumar D, et al. Holt-oram syndrome: A Rare Variantet. Iran J Med Sci 2017; 42: 416-419. Usang U, Agan T, Inyang A, et al. Syndromic anorectal malformation associated with Holt–Oram syndrome, microcephaly, and bilateral corneal opacity: A case report. Journal of Medical Case Reports 2016; 10. Rodagi S, Surana SS, Potdar VR, et al. Holt-Oram syndrome associated with aortic atresia: A rare association. Heart Views 2016; 17: 27. Shah V, Tharini G, Manoharan K. Monilethrix with holt-oram syndrome: Case report of a rare association. International Journal of Trichology 2015; 7: 33.